This blog is about the sweet things in life, but I’ll warn you, this post is not so sweet. I have to divert for a moment and talk about something that is incredibly deplorable and heartbreaking to me. 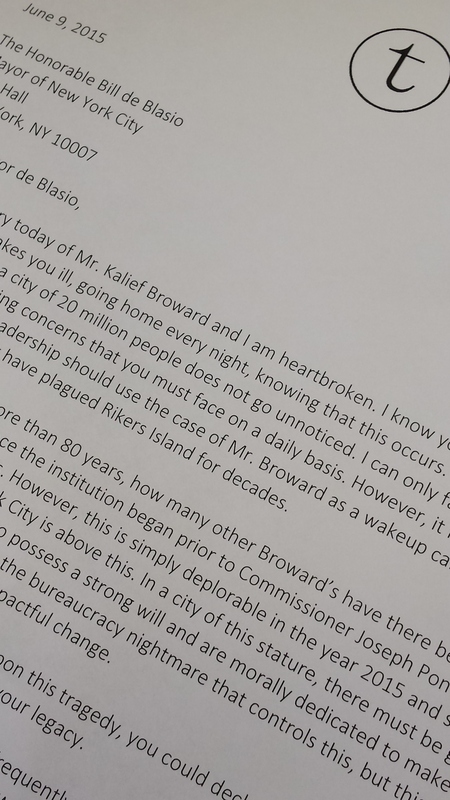 So much so, that I wrote a letter to the Honorable Bill de Blasio, Mayor of New York City. Ask me if I’ve written my own mayor in Austin? The answer is No, I haven’t. And shame on me. I’m struck by the fact that a story about Kim Kardashian throwing Kanye West an epic birthday party receives far more coverage and hundreds of thousands of views by people, compared to the thousands who have viewed the news story of Kalief Broward. Who? Kalief Broward. What does this say about our society? The injustice that occurred should not go unnoticed and that’s why I felt compelled to write the NYC Mayor. After hearing the story of the 22 year old boy from the Bronx, named Kalief Broward whose ordeal began when he was just 16. He was wrongfully jailed for allegedly stealing a back pack back in 2012. His mom could not afford his $3,500 bail. Therefore the boy spent more than one thousand days in Rikers awaiting a trial that would never happen. He was never convicted. Kalief spent two years in solitary confinement and endured unspeakable violence while in Rikers, New York City’s jail complex, which you probably know is notorious for inmate neglect and abuse. He attempted to end his life several times and spent time in various psychiatric wards until finally taking his life this past weekend at his home at age 22. Undoubtedly Kalief experienced severe psychological trauma and depression. In 2014, the Department of Justice reported about the “rampant use of unnecessary and excessive force” by guards against teenage inmates on Rikers. Most of the inmates — about 85 percent — have not yet been convicted of a crime; they are pretrial detainees. Don’t get me wrong, a prison such as Rikers shouldn’t be a nice place. Nor should it be a country club. But it should be fair and no one, not even inmates should endure horrors as this. We have rights in this country to an expeditious and fair trial. There is something seriously wrong here. The system failed Kalief Broward and who knows how many others. I can only hope that because of the media attention and perhaps even a pleading letter from a girl in Texas will make a difference. I guess the moral of my post is, stay hopeful. Don’t give up. Even when it all seems impossible, don’t stop trying. You never know when what you do might make a huge difference to someone else. You could change history. You could change a heart.